Our community of grassroots partners, staff members, donors, young professionals, diasporans, advisors, and volunteers all embraced a revised Theory of Change for IDEX* in 2014, which emerged from an inclusive and participatory evaluation process over the past ten years with our partners and leaders in philanthropy. 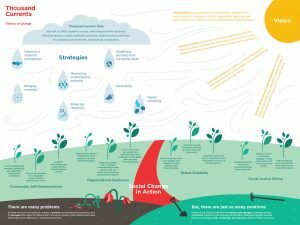 The IDEX Theory of Change lays out a pathway to transformative social change, based around four areas of concentration: community self-determination, organizational resilience, global solidarity, and social justice giving. Three years later, we are living into this revised Theory of Change with greater depth and devotion. Through changes to our staffing structure, we remain true to one of our greatest strengths for 32 years – adapting and responding thoughtfully to the changing moment. We are now more able to implement our Theory of Change by adding new key positions (such as grants coordinator, community engagement manager) and restructuring to help our leader-full org become even more efficient and effective (now creating a senior management team comprised of the Executive Director, Deputy Director, Director of Finance and Administration, and Director of Philanthropic Partnerships). All the while, we focus on remaining nimble and responsive and becoming more decentralized as staff work virtually from new locations such as Berkeley, Washington DC, New York, Dakar, New Orleans, Honolulu and more. Staff and Board at our Strategic Planning Retreat on February 17-18, 2017. Our new Director of Finance and Administration is Jenesha (Jinky) de Rivera overseeing all human resources, finance, reserve fund, technology and legal functions at IDEX during this critical moment of growth and maturity. 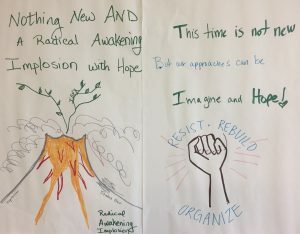 We now have a fully staffed programs and communications team to manifest the important work of community self-determination, organizational resilience and global solidarity. This team is led by Deputy Director Solome Lemma with four incredible directors: Luam Kidane, Regional Director for Africa; Trishala Deb, Regional Director for Asia; Katherine Zavala, Regional Director for Latin America; and Jennifer Lentfer, Director of Communications. As Grants Coordinator, Heather Masaki supports the regional directors with their grantmaking, alliance building and capacity building work with partners. Veronica Moreno (previously our Operations Manager) has stepped into the role of Community Engagement Manager and along with Jennifer will work to strengthen outreach and communications with our community – both online and offline. Three incredible artists-in-residence, Pregs Govender, Sharon Bridgforth, and Omi Jones, also join this team on a contract basis to offer cultural work as part of how we do build and conceive programs and communications, especially through learning exchanges. Our philanthropic partnerships team has also grown. Led by Rajiv Khanna, Director of Philanthropic Partnerships, this team works to raise and move resources to the grassroots while partnering in meaningful ways with donors, investors, funders, and leaders in the diaspora for better solidarity based approaches to social justice giving and investing. Jessie Spector has joined us as the Director of Donor Organizing; Stephanie de Wolfe as Director of Diaspora Partnerships; Hafsa Mustafa as our Learning and Evaluation Manager and Joanna Levitt Cea will continue on as the Director of the Buen Vivir Fund, our exciting new experiment led by grassroots leaders in the Global South that redefines the terms and returns of impact investing. Additionally, IDEX is also acting as the host for the Grassroots Climate Solutions Fund coordinated by Hilda Vega. This collaboration of four public foundations (IDEX, Grassroots International, Urgent Action Fund, and Global Green Grants) seeks to strengthen, amplify, and unify climate justice solutions globally, especially those led by grassroots groups including indigenous peoples, women, and youth. Our leadership role in this collaboration sets the precedence of transformation in the philanthropic sector as a whole. Each new addition to the staff team, including new Executive Assistant, Dino Foxx, brings with them such immense passion, creativity, commitment and discipline. I am very proud of the leader-full-ness of our team, that each of our staff loves the role they find themselves in, while also being completely driven to support the team to succeed as a whole. We strive always to “walk our talk” and practice our IDEX values of courage, integrity, community, effectiveness, leadership, and innovation in all that we do. As we live into our new identity as Thousand Currents (new website coming next month! ), what we ask of you, our community, is to keep us focused on delivering results, remaining accountable, and always learning with our partners and you!